Meat is expensive. There are fewer and fewer “cheap” cuts. One that is only obscenely expensive is chicken drumsticks. But how do you make them into a classy meal or appetizer? By trimming them into Drumstick Lollipops. 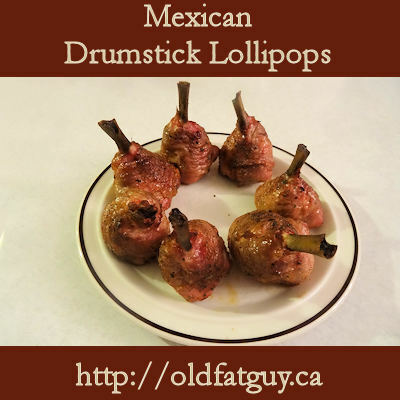 Add some Mexican Seasonings and you have Mexican Drumstick Lollipops! You start by cutting all around the bone about 1 1/2 inches above the knuckle on the end of the drumstick. What you are trying to do is cut out all the ligament connections at the bottom of the meaty part of the drumstick. After making the cut, slide your thumb under the skin and force it over the knuckle at the end. If there are any white ligaments left hanging from the meat, cut them off with a knife or poultry shears. Cut a flat spot on the top of the drumstick so you can stand it on end. Use poultry shears to cut through the bone just above the knuckle. Sprinkle the drumsticks with Mexican seasonings. You can use a commercial mix or my homemade version. You can also use any other flavour of seasonings you like such as Cajun, Italian, Greek, etc. Mix the melted butter and vegetable oil and put it in a small roasting pan. Stand the drumsticks up in the pan and put them in a 230 F smoker for 1 1/2 hours or until the internal temperature is over 155 F.
If you want to use your oven, cook the drumsticks at 350 F for 50 minutes. When you take them out of the smoker or oven, increase the temperature of the smoker or oven to 400 F.
Take the drumsticks out of the pan and pour the butter/oil drippings into a bowl. Brush the drumsticks with the drippings and sprinkle with seasonings again. Stand them in the pan and cook for 20 to 25 minutes at 400 F until the skin is nicely browned. Plate the drumsticks by standing them on a plate. These are very tasty and are particularly good if you like dry wings. The skin is crispy and the spices give a good strong taste without being overly hot. This method of trimming the drumstick this way makes them easier to eat as the ligaments have been removed and the meat just bites off the bone. This is a classy appetizer or light meal from an inexpensive cut of meat. 15 ml (1 tablespoon) vegetable oil. Cut around the bone on each drumstick about 1 1/2 inch from the knuckle on the end of the drumstick. Force the skin below the cut over the knuckle. Trim any ligaments remaining with a knife or shears. Cut the knuckle off with kitchen shears. Cut a flat spot on the top of the drumstick so it will stand on end. Sprinkle the drumstick with half the seasonings. Put the butter and oil in a small roasting pan. Stand the drumsticks in the pan. Cook the drumsticks at 230 F in a smoker for 1 1/2 hours or a 350 F oven for 50 minutes. Make sure the internal temperature is over 155 F.
When you take the drumsticks out, increase the temperature to 400 F.
Pour the butter and oil into a bowl and brush the drumsticks with the oil. Sprinkle the drumsticks with the remaining seasonings. Stand the drumsticks in the roasting pan and cook for 20 to 25 minutes at 400 F until the skin is nicely browned. Great and easy dish to make for a party! Thank you for sharing! Butter and spices make difference. Can be fancy dish if we add frills from napkins on top of bones. I use foil inside frills and it makes easy to attach them. Thanks so much. Yes, you could decorate the bones. Some wrap the bones in foil while they are cooking to keep them lighter too. Thanks for the suggestions!